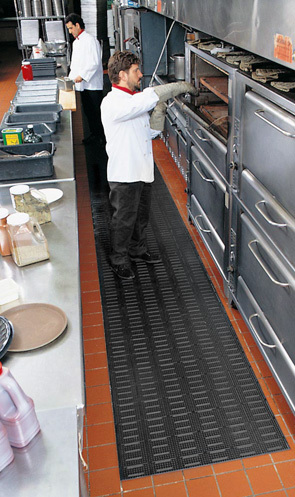 Made from a 100% Nitrile rubber compound, the Niru® Versa Runner® is designed to withstand harsh chemicals, greases, oils, and animal fats while creating a slip resistant work surface. Slotted perforations allow for drainage and a scraper-rib design runs side-to-side on the mat for added traction. Manufactured with MicroStop™ anti-microbial rubber compound that inhibits the growth of bacteria and fungi to provide a cleaner and healthier work environment. Overall mat thickness is 3/8". Made from a durable grease-proof 100% Nitrile rubber compound. MicroStop™ anti-microbial rubber inhibits growth of bacteria and fungi. Ribbed underside enhances anti-fatigue value and channels liquid away from the mat. Low profile for easy cart access.